Enjoy A Perfectly Heated Pool When You Want To Swim And Save Money When You Don't! 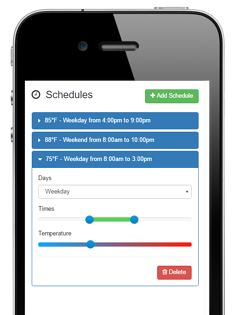 With HeaterReader™, you can set up to 12 timers for your pool’s heater and/or pump to meet your family’s preferences. This helps to ensure that your pool is ready when you want to swim, without worrying about your heater and pump running when the pool is not in use. That means that you can enjoy your swimming pool the way you want to, save money and reduce your carbon-footprint - all at the same time. And it couldn’t be easier to program your schedules. Simply login to the HeaterReader’s™ App, from anywhere in the world, and set your schedules. Want to try it for yourself, check out the HeaterReader™ App Demo. Manage multiple swimming pools? No problem! Use the HeaterReader™ Control Centre to monitor and manage multiple pool schedules.